At 11, Marquis Govan Has Some Things To Say About Ferguson The sixth-grader loves politics, admires some lawmakers and speaks without notes before the county council. "The people of Ferguson," he told them, "don't need tear gas ... I believe they need jobs." "The people of Ferguson, I believe, don't need tear gas thrown at them," 11-year-old Marquis Govan told the St. Louis County Council in August. "I believe they need jobs." The St. Louis County Council convened for a regular meeting on Aug. 19. It was only a day after a particularly turbulent night in Ferguson, one filled with protests, tear gas and many arrests over the fatal shooting of a black teenager by a white police officer. Only a couple dozen people showed up to the council meeting. Three spoke during the public comment section. One was Marquis Govan. 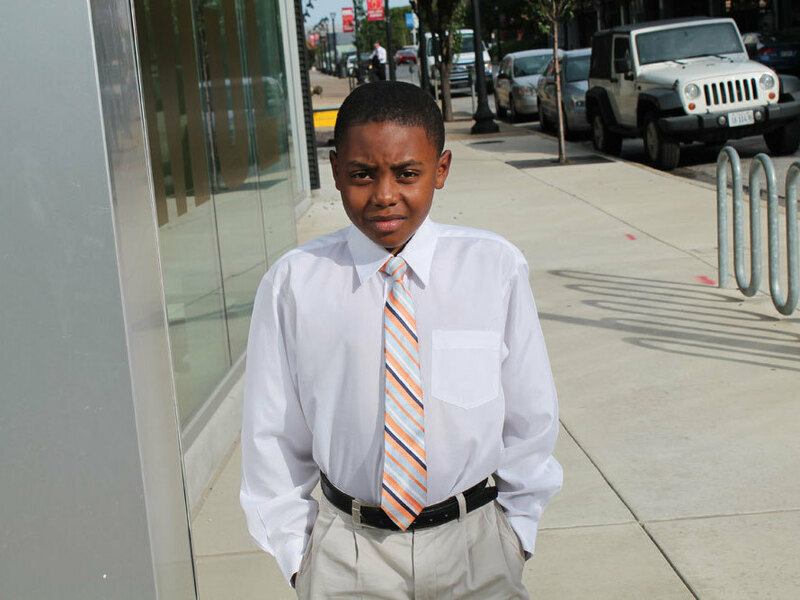 He lowered the microphone to match his 11-year-old height before speaking. "The people of Ferguson, I believe, don't need tear gas thrown at them," Marquis said. "I believe they need jobs. I believe the people of Ferguson, they don't need to be hit with batons. What they need is people to be investing in their businesses." 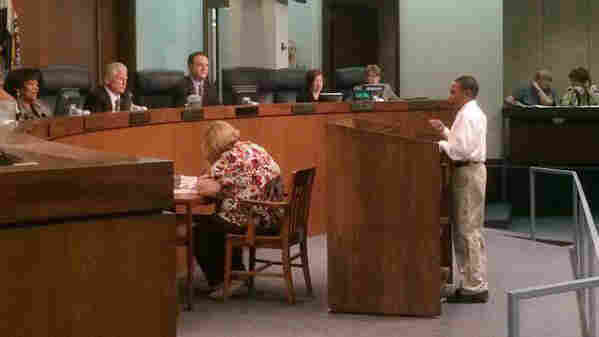 Wearing freshly pressed slacks, a white shirt and a tie, Marquis implored the council, and the public, to look at the underlying issues — economics and the racial makeup of the police force. "You're paying attention to the looting and things like that, when the real issues aren't being solved," he told the council. "There's a reason why those people are out there." He spoke with no notes. "I couldn't believe it, because I've seen adults come before us to speak, and they might have their prepared statement, and they stumble through it because they're nervous," says Councilwoman Hazel Erby. "Marquis was just perfect." Erby has been on the County Council for more than 10 years. She knows Marquis' family, and has watched the boy's interest in politics blossom over the years. She recalls him at a town hall meeting last year. Marquis Govan of St. Louis got interested in politics by going along with his great-grandmother to vote. "One of the questions he asked just blew everybody away. I think he said, 'How are you going to create businesses? We have businesses now. But how are you going to create businesses and then retain them in St. Louis County?' " she says. "Whatever he said, it was so intellectual that I couldn't even go back and repeat it." When he's not at county council meetings, Marquis is a student at Loyola Academy in St. Louis. Between classes, the sixth-grade political junkie opines on national politics, deriding certain senators as "politicrats." "I will call Mary Landrieu a politicrat," he says. "I will call Mark Pryor a politicrat. They will do anything to stay in Washington." "I told my colleagues, the teachers, that they better be ready for Marquis when they're giving instruction in class," says Eric Clark, president of Loyola, a rigorous Jesuit school that attracts low-income students who take an admissions test and pay on a sliding scale. "This is my sixth year here, and I cannot recall a young man that's been so interested in politics," Clark says. Many Loyola students come from tough backgrounds, as did Marquis. "My parents, they were not in the conditions — let's say that — to take care of me. They didn't have what they needed to take care of me," he says. As a baby, Marquis spent time in foster care. When he was 2, his great-grandmother, Jennie Bracy, took custody of him. She gave him his first taste of politics by taking him along with her when she went to vote. "Getting him up early in the morning to go to the polls with me, he became very interested," Bracy says. "He knew that he needed to know these candidates so I would select the right person." Marquis says he first starting thinking about politics during the 2008 presidential election. He was 5. "Yeah, I really did start at a very young age," he says. "My grandmother always had the news on. We always watched funny shows. And I mean, everybody was talking about it. At points, I would stop by political shows, like, 'What in the world are they talking about?' And I started getting it." Marquis does have other interests. He's a soccer fan and played for a while. But his main activity is politics. For now, he wants get his classmates interested in the political process — one day, he may need their votes. He describes himself as a Democrat, though more conservative than one of the politicians he hopes to emulate. "I want to be one of those leaders like Nancy Pelosi," he says. "But sometimes I don't necessarily agree with her politically. I want to be a leader like her, except I want to be this new wing. I want to lead all the conservative Democrats and moderates who are sometimes left out of their party, saying they're party-switchers. They're not party-switchers. They're compromisers." The 11-year-old, who reads President Obama's memoir between classes, has another dream, says his great-grandmother. "He says I'm getting to be an old lady, and he's going to have to ask God to let me live a little bit longer so that I can see him become the president of the United States," she says. An ambitious goal to be sure, but If Marquis ever takes the oath of office near a city hall or the nation's capital, his political start may be traced back to a tumultuous August evening when he decided to speak up.